While we don’t offer a lot of services at LaCava Auto Parts and Services, the options that we do provide are essential to our customers. We sell a wide range of parts and accessories to commercial and individual clients, serving the needs of the local community for over 70 years. Customers who purchase windshield wipers can benefit from one of our free services, which includes installation of wiper blades at no cost. We also offer free battery testing services to help our customers stay safe rain or shine. However, in addition to these free opportunities, we also offer two types of professional services that individual and business customers can use to their advantage. There are many businesses that count on quality performance from hydraulic hoses in Fall River. In fact, the variety of industries that utilize hydraulic equipment is quite vast, particularly in the New England region. Quality hydraulic hoses are a key component for any vehicle or equipment system. The services that we provide to our customers in the Greater Fall River area offer the ultimate fluid conveyance options available in the industry today. We can provide a wide range of pressure ranges for ultra-high and low-pressure requirements. Our inventory also includes hoses designed specifically for extreme conditions, including temperature and abrasion resistance. All of the hoses that we use at LaCava Brothers are built with the needs of high-performance applications in mind for the longest lasting, most durable results possible. We use only the most trusted brand of hydraulic hoses in the industry. Gates has been a leader in hydraulic hoses since 1911. The MegaCrimp couplings that we offer are used to provide more than 500 percent increased corrosion resistance than other popular brands. Our hydraulic hose services are available seven days a week to best meet the needs of our customers. Regardless of the industry that you work in or the type of equipment you use, you can count on LaCava Auto Parts and Services to provide you with top quality hydraulic hoses in Fall River and the surrounding area. 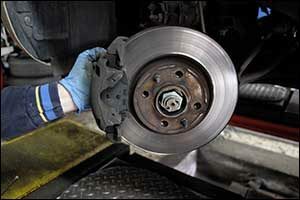 Changing your brakes does not have to be a budget-breaking repair. There are ways to ensure the safety of your vehicle – and those who ride in it – while still saving some money with rotor turning services. While this service is not an option every single time you change your brakes, if you have brake rotors that are still thick enough to provide proper braking, rotor turning services might be the answer. At LaCava Brothers, our team of highly-trained specialists can turn your rotors for you. Make sure to ask about this service whenever you are doing a brake job to see if it is a possibility. If you aren’t familiar with rotor turning services, it is essential to understand what to expect. While rotor turning or resurfacing can help you to get more life out of your current rotors before they need to be replaced, there are certain conditions where it is not possible. Rotor turning involves the resurfacing of the brake disc with a special tool, removing all of the corrosion and brake pad deposits that come from normal wear and tear. When done properly, rotor turning services can be used to smooth out any problems that can result in vibrations, including varying thicknesses. However, if our brake disc does not have a minimum safe operational thickness, it won’t be a candidate. In that case, replacing your rotors would be the better choice. Whether you contact LaCava Auto Parts and Services for rotor turning services of servicing of hydraulic hoses in Fall River – or if you just need parts so you can do it yourself – our team is here to help. We can answer any questions that you might have about any of the services of product sales that we offer, whether you call or visit our Fall River, Massachusetts store. 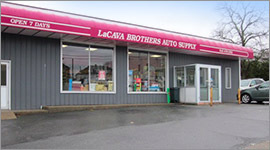 For over 70 years, LaCava Brothers have been synonymous with excellent service and true value in the Greater Fall River area. Contact our team by calling 508-676-1951 or stop by our store located on Bedford Street in Fall River.